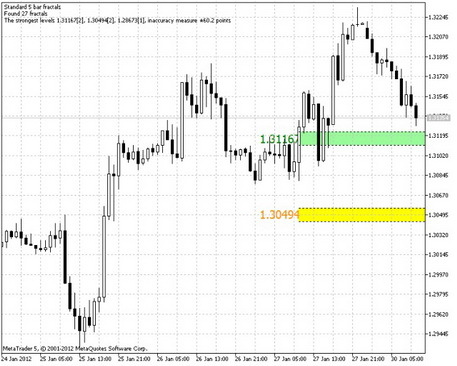 This indicator is compatible with the MetaTrader 4 platform. The robot determines the fractal levels and does it in the following way. On the selected interval, there is a search for fractal extreme and areas of their maximum concentrations. In the settings, you can set the parameters, so the robot could search only troughs or tops. The troughs correspond to the levels of support, while the tops are resistance levels. sBars - the number of bars considered while searching for fractals.